Asian stocks closed broadly lower on Wednesday and safe-haven assets such as gold and the Japanese yen climbed after U.S. President Donald Trump said he was “not really” pleased with the U.S.-China trade talks so far and that there was a “substantial chance” his planned summit with North Korean leader Kin Jong Un in June may not work out. Chinese markets fell the most in a month as coal mining stocks slumped after authorities intervened in the coal market to bring down prices. The benchmark Shanghai Composite Index tumbled 45.11 points or 1.4 percent to 3,169.24, while Hong Kong’s Hang Seng Index plunged dropped 568.71 points or 1.8 percent to 30,665.64. 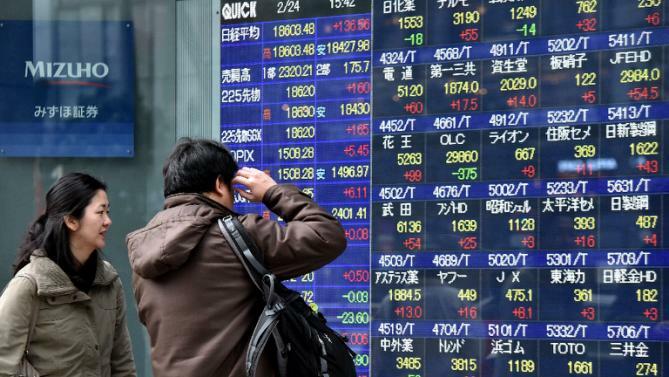 Japanese shares fell the most in two months as a stronger yen on trade worries pulled down shares of exporters. Mixed manufacturing data also weighed on the markets. The manufacturing sector in Japan continued to expand in May, albeit at a slower pace, the latest survey from Nikkei revealed with a manufacturing PMI score of 52.5, down from 53.8 in April. The Nikkei 225 Index slumped 270.60 points or 1.2 percent to 22,689.74, dragged down by exporters, shipping companies and steelmakers. The broader Topix Index ended down 12.26 points or 0.7 percent at 1,797.31. Mitsui OSK Lines, Kawasaki Kisen and JFE Holdings fell around 3 percent each. Australian shares ended lower for a fifth consecutive session, with energy stocks coming under selling pressure after Santos rejected Harbour Energy’s $10.8 billion takeover offer. The benchmark S&P/ASX 200 Index dipped 9.40 points or 0.2 percent to 6,032.50, while the broader All Ordinaries Index ended down 9.60 points or 0.2 percent at 6,140.30. Shares of Santos slumped 8.4 percent, and Woodside Petroleum, Origin Energy and Oil Search lost 1-2 percent. Healthcare stocks also underperformed, with CSL and Healthscope declining 1-2 percent. Commonwealth Bank shed 0.6 percent after it agreed to sell a 37.5 percent stake in Chinese insurer BoComm Life Insurance Company Limited to Japan’s Mitsui Sumitomo Insurance. ANZ and NAB also closed lower, while Westpac edged up marginally. Australia’s construction work done rebounded slightly in the first quarter after falling sharply in the previous quarter, the Australian Bureau of Statistics reported today.